It’s that time of year when the evenings are chilly and the days are still a tad too warm. So how about a nice open pattern that can be worn around to help keep the chill out after the sun goes down? 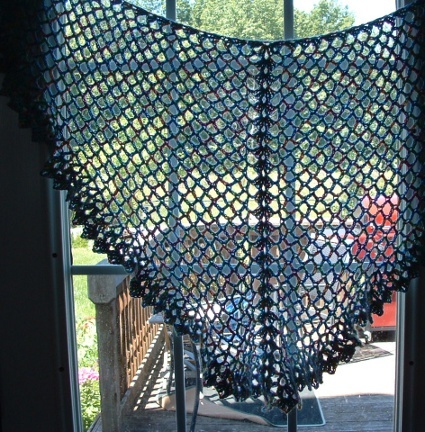 This shawl can be done to any size with any yarn and would make a great prayer shawl or charity donation. It starts out as a triangle and shifts to a more circular shape. The edging resembles tiny leaves after blocking! It works well with all yarn types: solid, semi-solid, gradients, variegated… How about 2 different colors? Try one color for the main body and a different one for the edging. It’s easy enough to work while traveling, watching TV, or just relaxing. Once you make one, you might find yourself making a bunch! Note: This pattern can be done to any size with any hook and yarn combination; expect it to grow by about a third during blocking. Shell: (3dc, ch 2, 3dc) worked into a ch-2 sp. V-st: (Dc, ch 2, dc) in indicated stitch. The bold sections are the central spine. On row 2 and beyond, work into the ch-2 space of the previous row. Row 1: Ch 3, make 2 dc in same stitch, ch 2, dc in ch-2 space, ch 2, shell in next ch-2 space, ch 2, dc in last ch-2 space, ch 2, make 3 dc in turning ch. Row 2: Ch 3, make 2 dc in same st, ch 2, dc in ch-2 space, ch 2, skip st and dc in next ch-2 space, ch 2. Shell in ch-2 space of previous shell, ch 2, dc in ch-2 space, ch 2, skip stitch and dc in next ch-2 space, ch 2, make 3 dc in turning ch. Row 3: Ch 3, make 2 dc in same st, ch 2, dc in ch-2 space, ch 2, dc in next dc, ch 2, dc in next dc, ch 2, dc in ch-2 space, ch 2. Shell, ch 2, dc in ch-2 sp, ch 2, dc in next st, ch 2, dc in next st, ch 2, dc in ch-2 space, ch 2, make 3 dc in turning ch. Row 4: Ch 3, make 2 dc in same st, ch 2, dc in ch-2 sp. *Ch 2, dc in next st.* Repeat from * to * 4 times. Ch 2, dc in ch-2 sp, ch 2, Shell, ch 2, dc in ch-2 sp. *Ch 2, dc in next st.* Repeat from * to * 4 times, ch 2, dc in ch-2 sp, ch 2, make 3 dc in turning ch. Row 5: Ch 3, make 2 dc in same st, ch 2, dc in ch-2 sp. *Ch 2, dc in next dc. * Repeat from * to * 6 times, ch 2, dc in ch-2 space, ch 2, Shell, ch 2, dc in ch-2 sp. *Ch 2, dc in next dc. * Repeat from * to * 6 times, ch 2, dc in ch-2 space, ch 2, make 3 dc in turning ch. Row 6: Ch 3, make 2 dc in next st, ch 2, dc in ch-2 sp. *Ch 2, dc in next dc. * Repeat from * to * 8 times. Ch 2, dc in ch-2 sp, ch 2, Shell, ch 2, dc in ch-2 sp. *Ch 2, dc in next dc. * Repeat from * to * 8 times, ch 2, dc in ch-2 sp, ch 2, make 3 dc in turning ch. Continue repeating Row 6, increasing the * to * sections by 2 for each repeat. (For example, row 7 will have 10 repeats, row 8 will have 12 repeats, etc.) Work to desired size and then go to the edging. Row 1: Ch 3, make 2 dc in same st, ch 2, V-st in next dc. * Skip the space and V-stitch in next dc. * Work * to * to center. Shell, ch 2, V-st in next dc. *Skip the space and V-stitch in next dc. * Work * to * across row, ending with ch 2, make 3 dc in turning ch. Row 2: Ch 3, make 2 dc in same st, ch 2. *Place (2 dc, ch 2, 2 dc) in ch-2 space. * Work * to * to the center. Ch 2, shell, ch 2. *Place (2 dc, ch 2, 2 dc) in ch-2 space. * Work * to * across row ending with ch-2, make 3 dc in turning ch. Row 3: Ch 3, make 2 dc in same st, ch 2. *Place (3 dc, ch 2, 3 dc) in ch-2 space. * Work * to * to the center. Ch 2, shell, ch 2. *Place (3 dc, ch 2, 3 dc) in ch-2 space. * Work * to * across row ending with ch-2, make 3 dc in turning ch. Finish off. Finishing: Weave in ends, wet shawl and block with pins inserted into the ch-2 space of each shell to replicate the look of tiny leaves around the bottom of the shawl. Allow to dry thoroughly before unpinning. I’m a designer who likes to tinker around with stitches to see what I can come up with. I like symmetry and geometric shapes. I find inspiration in the world around me. I like to take my ideas and translate them into crochet and knit designs. I find I like to design shawls more than anything else, but an occasional hat/scarf/mitt set finds its way into the design lineup. I’m also a big fan of simple patterns that look harder than they are! More bang for the buck! This is a beautiful pattern!! I’m making it using size 10 crochet thread and a G hook, for a lacy look (at least that’s the hope!). Thank you for taking the time to write out the pattern for all us “non pattern making” people!! I do not see any bold items so I am not certain what is the center line? 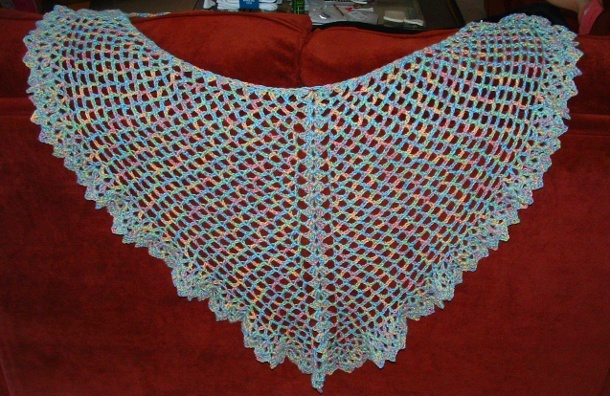 Thank you for the great shawl pattern I found a great launching pattern to decorate with my recycle/repurpase touches and entered it for my first stash bet. Did not win but had a lot of great comments and people want info on it will point them your way.